Jeannie McLean (pictured right) is an Auckland-based Business Manager in the education sector, and a writer of short stories and young adult crime novels. You can read more about her and her own writing at her website here, and her blog I did do it! Confessions of a crime writer, here. Today Jeannie reviews a debut novel that straddles that border between romantic suspense and crime fiction (a place the likes of Sandra Brown and Tami Hoag, amongst others, have trodden at various times), DRIFTWOOD by Auckland writer Shauna Bickley. When is crime story not a crime story? Auckland writer, Shauna Bickley recently won the UK based Kinglake Unpublished Author Competition in the Romance genre with her novel ‘Driftwood’. The crimes are not in-your-face, detailed with grizzly forensic facts, nor is it a police procedural; But looking at Wikipedia’s definition of crime novels as the ‘genre of fiction that deals with crimes, their detection, criminals and their motives, ‘Driftwood’ fits. It is a pacy story of the unfinished business between Juliet, and Luke who turns up after many years. Is it coincidence that Juliet suddenly finds herself involved in inexplicable accidents? There is the slow revelation that something sinister is present and Luke seems to be the common factor. When Juliet leaves Auckland for Sydney on business, she convinces herself she was imagining it all, until Luke turns up unexpectedly and she realises her life is in danger. Yes, it has romance in it – but so do most recognisable ‘crime’ books. Think, Donna Leon and the lovely gentle relationship between husband and wife, Commissario Guido Brunetti and Paola, or Stieg Larsson’s Lisbeth Salander and Mikael Blomkvist’s ‘will-they-won’t-they’ or closer to home, Vanda Symon’s Sam Shephard and Paul Frost. In the end it doesn’t matter whether if it is more romance, less crime or vice versa; like the above mentioned crime novels, this is a good read – and, the bonus, by a local author. 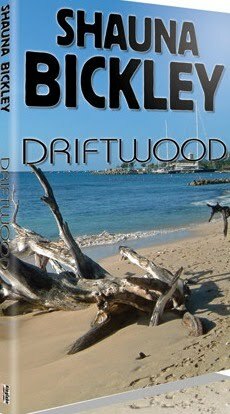 ‘Driftwood’, by Shauna Bickley is available from: Kinglake Publishing, Amazon.co.uk, and several other online retailers. Reviewed by Jeannie McLean, an Auckland based author of 5 books, two of which are crime based novels for young adults. What do you think of Jeannie's review? Where is the dividing line between romantic suspense and crime fiction with romance? Does it matter? Are genre divides more important to marketers than readers? Have you read any romance/crime novels? Thoughts welcome. Craig - Thanks for hosting Jeannie. Jeannie - Fine review - thank you :-). Your review is a great reminder that the lines that divide genres and subgenres of books are quite fuzzy. Sometimes it really is hard to tell where one leaves off and another begins. And why shouldn't a book have elements of both crime fiction and romance? Or crime fiction and science fiction. Or crime fiction and history?